7/26 Cup of Coffee: Michael Chavis continued his recent hot streak, but it was not enough to carry Portland in a back-and-forth affair. Mike Miller had a big game for Pawtucket in the ninth spot in the order. Brian Mata was solid again for Greenville, but took a tough-luck loss. The PawSox rallied late to grab the win thanks to an RBI single by Aneury Tavarez and Mike Miller scoring on a double play in the seventh. Miller had a great night out of the nine hole, going 3 for 3 with a double, a walk, two runs scored and two stolen bases. He was credited with a steal of home when Rusney Castillo was caught in a rundown. Matt Dominguez hit his eighth homer of the season, going 2 for 5 with two RBI on the night. Kyle Kendrick struck out seven in five innings of work, but Edgar Olmos picked up the win in relief. It was his seventh of the year. 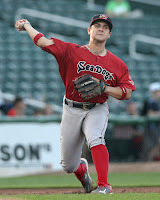 Despite a big night from Michael Chavis, Portland came up just short in a wild, back-and-forth tilt in New Hampshire. Chavis reached base five times, going 2 for 3 with his seventh home run with Portland. He also added a double, three walks, three runs scored and two RBI. Jeremy Barfield tagged his 14th homer of the year, going 1 for 2 with two walks, two runs scored and two driven in. Despite scoring 10 runs, the Sea Dogs left plenty more on the table, stranding a whopping 13 runners. Portland collected 10 hits and nine walks on the game. Mike Olt struck out to end the game, stranding the tying and go-ahead runs on base. Picking up Monday's suspended game where it left off in the sixth, the game remained knotted at 1-1 until Austin Glorius surrendered a two-run walk-off homer in the tenth. Adam Lau threw 3 1/3 shutout innings of relief, striking out three. Josh Ockimey went 1 for 3 with a walk. A four-run burst in the top of the first was all the offense Salem could muster in game two. The inning was capped by a bases-clearing triple by Tate Matheny. That was the lone extra-base hit Salem got. The last 17 Salem batters of the game did not register a hit. Brian Mata was a tough-luck loser on Tuesday despite another solid outing for the 18-year-old. Mata gave up two runs (one earned) on five hits in five innings of work. He struck out six and walked just one. Bobby Dalbec went 2 for 4 with a run scored. Mitchell Gunsolus drove in Greenville's lone run. Michael Osinski had his second straight multi-hit game, but Lowell could not muster much offense beyond their leadoff man. None of Lowell's six hits on the game were for extra bases. Enmanuel De Jesus threw six solid innings, taking the no-decision. De Jesus gave up one run on three hits, striking out five and walking three. The GCL squad rallied late from five runs down to take the win on Tuesday. Cole Brannen went 3 for 4, plating the tying run in the seventh on an RBI single. Juan Carlos Abreu and Tyler Dearden got the rally started with back-to-back two-run singles. Ricardo Cubillian scored the go-ahead run on a wild pitch in the eighth. Tuesday's DSL game was suspended with just one out in the top of the first. It will be continued on Aug. 10. Player of the Game: Reaching base five times and collecting his fourth straight multi-hit game, Michael Chavis gets the honors. After seeing his average dip to .240 on July 15, Chavis has bounced back nicely of late, raising his average to .281. Chavis has struggled with his on-base percentage, so the three walks on Tuesday were a welcome sign of patience. They were his first free passes in eight games.